What would you say to owning the most rare 1980s American performance car ever made (only 117 or 112 total were produced)? How about if I throw in that it was a Buick and it was a "Grand National"? Would that spark you interest? Most reading this are now picking their brains trying to remember what special edition (Regal based) Grand National was produced in low numbers – after-all every year the Grand National was produced it was made in much larger numbers than 117 or 112. However it’s not what you think. This low production Grand National wasn’t built on GM’s rear-wheel drive G-body platform like the Regal based Grand National. Surprising it was built on GM’s new front-wheel drive H-body platform. Buick had moved its upscale Electra from GM’s traditional rear-wheel drive B-body to the new front-wheel drive H-body platform for the 1985 model year. Buick’s more pedestrian LeSabre made the move for the 1986 model year. The new front-wheel drive LeSabre was available in both a 2-door and 4-door configuration just like the front-wheel drive Electra. However where the Electra had a very formal roofline for the 2-door Electra, the 2-door LeSabre had a semi-fastback roofline which gave the 2-door LeSabre a very sporty overall look. This is where this special very low production Grand National comes into the picture. Buick which had capitalized (with its rear-wheel drive Grand National) on the popularity of the NASCAR racing circuit where its Regals based race cars were seeing much success. Buick saw no reason why it’s new 2-door LeSabre couldn’t also be a successful NASCAR offering, hence Buick’s LeSabre Grand National offering for 1986 which helped Buick qualify the 2-door LeSabre for NASCAR duty. The LeSabre just like the Regal Grand National could be ordered in any exterior color as long as it was black. The original Buick advertisement for the LeSabre Grand National did mention that black and white were the only exterior colors available (the advertisement showed a white Grand National) however by production black became the only color available. Even so, to this day rumors persist of a white LeSabre Grand National having been produced but the car has never surfaced – the rumored white production LeSabre Grand National may have been the preproduction car shown in the Buick Advertisement. Back in 1986 the idea of a front-wheel drive performance car was something buyers were just starting to warm up to. The release of the successful front-wheel drive 1983 Pontiac 6000 STE had other GM divisions and American automakers scrambling to bring to market their own front-wheel drive performance car offerings. Buick was no different in that respect – it had offered the a more sporty T-Type model of its front-wheel drive Century model starting in 1983. Even Carroll Shelby during this time had a few factory built front-wheel drive (performance oriented) Dodge models using his name. It was certainly a dawn of a new era. On the 1986 LeSabre Grand National to compliment the black exterior paint scheme Buick added black trim pieces in some places where the other LeSabres used chrome. The only chrome used on the LeSabre Grand National were the front and rear chrome bumpers, a chrome strip just above the rear taillights, a chrome front grille, a chrome door handle, chrome headlight bezels, a chrome strip above the side windows, and chrome strips around each wheel well. Buick also made standard a large front chin spoiler for the Grand National along with a few "Grand National" emblems on the exterior. The LeSabre’s hood ornament on the Grand National was replaced with a decorative plaque that laid flat on the hood. As mentioned previously Buick produced the Grand National to qualify the 2-door 1986 LeSabre for NASCAR duty however a normal 2-door LeSabre would have been enough for this task. However Buick had a big trick up its sleeve, it gave the Grand National an aerodynamic advantage by purposely using smaller rear side windows which improved aerodynamics on the race car version. The smaller rear side windows would have never been certified for NASCAR use if the production Grand National did not use them. And most 2-door LeSabre buyers who were more traditional Buick loyalists more than likely would not have liked these smaller windows which is the whole reason the LeSabre Grand National was produced. 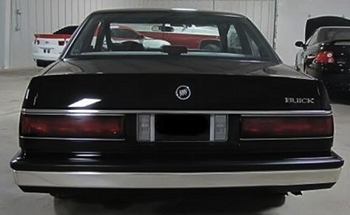 The rear window frame on the Grand National was the same on the 2-door LeSabre however Buick put a large black insert where each window normally resided and inside the insert was a small vertical window and black horizontal louvers. Making the Grand National model just for a slight aerodynamic advantage on the NASCAR circuit seems a little excessive, but racing just like today is very competitive and any and every aerodynamic advantage was sought after. Under the hood was the standard LeSabre engine, a 150 horsepower (200 lb-ft of torque) 3.8 liter Sequential-Port Fuel Injection (SFI) V6. It would have been nice if Buick could have dropped in the 1986 (Regal) Grand National’s 235 horsepower turbo 3.8 liter SFI V6 into the LeSabre Grand National but it was not to be. The problem was the LeSabre’s front-wheel drive transmission/transaxle just wasn’t strong enough to handle the power especially the 330 lb-ft of torque of the 1986 turbo 3.8 SFI V6. And even if it could one could only imagine the amount of torque steer this monster motor of the 1980s would have produced on the front-wheel drive LeSabre – drivers at full throttle would have been fighting with the steering wheel to keep the car from veering off the road and going into a tree. As it turned out (for 1986) a 150 horsepower 3.8 was enough horsepower – in fact for a front-wheel drive car it was a lot since it matched the output of many standard V8s at the time. 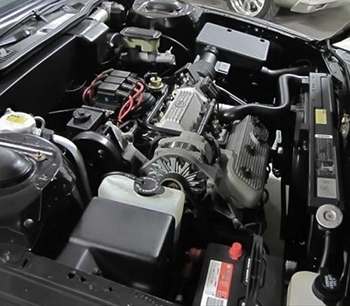 As a comparison the base 1986 Oldsmobile 4-bbl 5.0 liter (307 CID) V8 produced 140 horsepower. Never-the-less the 3.8 liter SFI V6 had enough power to light up the front tires. 0-60 mph took around 10 seconds which back in 1986 was quick. The LeSabre Grand National came standard with 2.84 axle ratio which was a happy median between fuel efficiency and performance. The Grand National did have a semi-performance oriented exhaust sound which was attributed to dual outlet pipes from the muffler. Unfortunately the twin outlet pipes were situated on one side of the rear and hard to see – a set of shiny chrome tip exhaust tips would have gone a long way in upgrading the "wow factor" of the Grand National. The LeSabre Grand National had the added benefit of a curb weight of just over 3100 lbs which not only helped it obtain quick acceleration times but provided good handling. The Grand National felt surefooted and very comfortable in the turns – it was a million times better in the turns than the previous rear-wheel drive land barge sized LeSabres. The Grand National came standard with the LeSabre’s (optional) best handling suspension – the FE1 suspension. The FE1 came standard with 15×6 inch aluminum wheels and P215/65R15 Goodyear Eagle GT tires which were the exact same size and type of tire that was standard on the rear-wheel drive Grand National. And this good handling didn’t sacrifice good ride quality – the Grand National still had a ride that soaked up the impact of slight to moderate road bumps and potholes, something most traditional Buick buyers wanted. Buick took the easy route with the LeSabre Grand National by requiring all of them to be equipped with the same options in the form of what is now referred to as a package (of options). The Grand National package added $1,237 to the base price of the LeSabre 2-door and provided enough standard features such as power windows, power door locks, and a power adjustable driver seat. Other notable standard items were a tilt steering wheel and cruise control. It’s possible a few Grand Nationals may have had some extra options but there’s no hard documentation to prove that. The interior just like in the rear-wheel drive Grand National only came in grey. 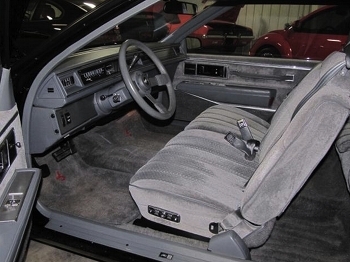 Unfortunately the LeSabre Grand National’s interior unlike the rear-wheel drive Grand National only came equipped with a cloth 60/40 split front bench seat and not sporty bucket seats. Because of this there was no sporty center console so the automatic transmission shifter was stuck on the steering column – not exactly befitting of a car with the Grand National name. Fortunately the attractive and sporty thick padded gray leather wrapped steering wheel from the rear-wheel drive Grand National was standard on the LeSabre Grand National. Overall the interior was a little too plain and basic. The overal interior and instrumentation layout was the same as the base LeSabre Custom 2-door which was nothing to get you too excited. When you see the interior of the LeSabre Grand National you realize that Buick engineers put all their emphasis on the exterior of the car. Yet even with the interior being a little pedestrian it was easy to find and understand the controls. The bench seat may have looked a little plain but it was comfortable. Hip, leg, shoulder, and head room were all plentiful and this includes the rear seating area. It was an easy car to get in and out even for the backseat occupants. The Grand National’s interior was a perfect example of functionality coming before form – which is not such a bad thing when you look at the big picture. 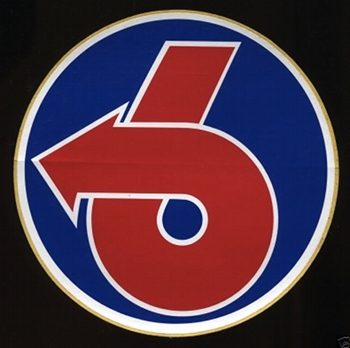 Buick used the rear-wheel drive Grand National’s basic "turbo 6" logo however the "6" on the LeSabre Grand National’s was red instead of two tone red and yellow. The reason red was only used on the LeSabre Grand National’s "6" was to denote that it was a non-turbo V6 powered Grand National. The main flaw of the LeSabre Grand National, was Buick’s shortsighted vision which only saw the Grand National as a means to get an aerodynamic 2-door body style certified for NASCAR. It hadn’t yet seen the potential for a sporty performance oriented front-wheel drive semi-fastback 2-door to compete head-to-head with the sporty European touring cars at the time. This type of shortsightedness relegated Buick to be mostly a choice automaker of the fuddy-duddy and senior citizen crowd shortly after the demise of the rear-wheel drive 1987 Grand National. Only very recently has Buick with the 2012 Buick Regal GS begun again in offering real performance- after a twenty five year hiatus it’s long overdue. 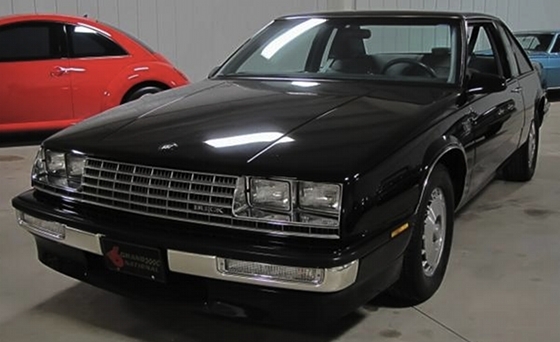 There could have been more to differentiate the LeSabre Grand National from the run-of-the-mill LeSabre. A set of slick front bucket seats with a leather seating option and a spruced up interior would have given the already attractive exterior a world class interior. Thirty extra horsepower added to an already powerful V6 would have been a nice touch. And a center console with an automatic shifter would have been a step in the right direction. Even better would have been a 5-speed manual transmission option. It’s a shame since the Grand National name had built-up quite a following and could have remained a performance model on different Buicks over the last twenty five years if Buick had stayed the course with improving the 1986 LeSabre Grand National. Unfortuately it was a one year wonder not returning for service in 1987. Notwithstanding the LeSabre Grand National was a well-tuned 1980s performance front-wheel drive car. Add to that it how it was the rarest performance Buick ever produced and you have an attractive car definitely worth owning.